Hello everyone! 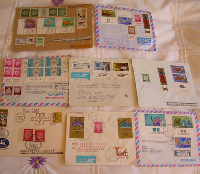 This is for lovers of postage stamps, mail art & surprises! For this swap we will be sending 3 partners one envelope each. ãƒŸâ˜† Needs to have at least 3 postage stamps on it. This will be easy for envies going international, for US, you can break down our 46c or add extra postage. ãƒŸâ˜† Needs to have some kind of mail art. A doodle, a collage, stickers, anything goes! Just make it something fun to receive. ãƒŸâ˜† Inside the envie will be a small flat surprise: stickers, postcards, used postage stamps, inspiration, tea, anything!